The power to answer some of our planet's most important questions. The definition of diesel fuel is simply a fuel that can be used to power a diesel engine. The first diesel engine that was exhibited by Rudolf Diesel in 1900 was run on Peanut oil, and while the Diesel motor has come a long way since 1900, the concept of using compression and heat to power an internal combustion motor still remains. Mineral diesel or petro diesel, as it is increasingly being known as, has dominated the market since thermal cracking and later catalytic cracking allowed the oil industry to produce a range of products with individual characteristics. Because diesel engines do not utilise oil for lubrication, higher Sulphur levels gave the fuel more lubrication, but ultimately caused greater pollution problems. Mineral diesel has since undergone a transformation to limit the amount of Sulphur and currently diesel sold on the Australian market has to be less than 10 ppm Sulphur. Low-sulphur diesel fuel is made by refining crude types that are naturally low in sulphur or by further refining diesel fuel using a process called hydrofining which removes the sulphur. Non-sulphur additives are then blended into the diesel to increase lubrication. The concept of converting vegetable oil to an ester was first realised in the 1850s, however there was no such thing as an internal combustion motor, let alone a diesel motor. Biodiesel (FAME; Fatty Acid Methyl Ester) was seriously considered as an alternative fuel after the oil shock of the 1970s created a financial incentive, while the Clean Air Act (USA) established the environmental incentive. By this stage, the development of the engine had determined that pure vegetable oil was unsuitable as it was too viscous and caused problems with atomisation and engine deposits. It had been suggested as far back as 1937, that the glycerol backbone of vegetable oil had little fuel advantages, and the science of creating esters from vegetable oil had been around since the 1850s. However the first real publication of Biodiesel being used as a direct fuel occurred in 1942 when acid catalysed palm oil was used to run a bus service over the summer of 1938. The dwindling supplies of mineral oil and the environmental advantages of Biodiesel, have now created the environment where Biodiesel is becoming a genuine alternative in the search for new generation fuel supplies. Biodiesel is a term used to define a fuel made from plant or animal material that can be directly used in a motor running on Rudolfs Diesels concept. The Fuel Quality Standards Act 2000 of Australia defines Biodiesel as 'a diesel fuel obtained by esterification of oil derived from plants or animals.' Put simply, it is a fuel derived from plant and/or animal matter rather than petroleum sources. Biodiesel is easily mixed with mineral diesel to create blends of diesel. The amount of Biodiesel added determines the blend name (eg. 5% Biodiesel = B5). Currently, the Biodiesel industry cannot supply society with enough material to completely convert to B100. As the industry grows, and the supply of mineral diesel decreases, the rate of Biodiesl blends will naturally increase. This will occur simultaneously with vehicle manufacturers modifying their engines to optimise the special characteristics of Biodiesel. It will also coincide with fuel standards being set for different fuel blends. Currently in Australia, a Fuel Standard only exists for a B5 blend, with special consideration being granted to some distributors who market a B20 blend. Over time more standards will be set which will eventually encompass a range of blends up to B100. Ecotech is currently supplying Biodiesel for use in B5, B20 and B100 vehicles and generators. The state-of-the-art Ecotech plant uses sophisticated, world-class German technology which has been employed successfully in Europe since 2000. Ecotech through its subsidiary Bsmart Technology, has the license to sell the technology internationally to companies outside of the European Union. 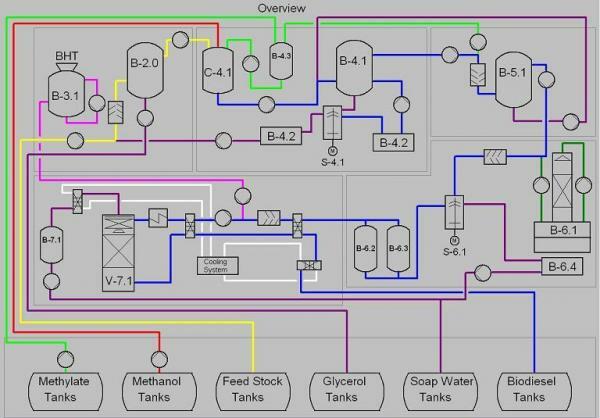 The Ecotech Biodiesel Production Process Chart (below) shows the flow from plants to pump. Ecotech employ a two stage, base catalysed esterification process. This process allows for a minimum of Potassium Methylate to be used, and with the use of ion exchange technology, a minimal amount of water is used during production. The two stage quasi-continuous process allows for quality control limits at each stage to be adhered to by recycling out-of-spec material back into the process. A graphical description of the process is below. All engine and vehicle manufacturers provide a material and workmanship warranty on manufactured products, and does not cover damage or problems caused by external factors such as fuel. If an engine experiences a failure that is caused by a fuel, (Biodiesel or regular petroleum diesel) the damage generally will not be covered by the OEMs equipment and workmanship warranty. The federal Chamber of Automated Industries in Australia have stated that a B5 blend that complies with either EN14214 or ASTM D6751 standards is deemed acceptable. All fuel produced by Ecotech are tested to meet Australian standards prior to being dispatched. Manufacturers are constantly changing their position with respect to Biodiesel, and enquiries as to the latest position of a particular vehicle, can be accessed on the manuFACTures website. Alternatively, an OEM Statement Summary chart can be accessed via http://www.biodiesel.org/resources/oems/. There are many sources publishing the myths and FACTs associated with Biodiesel. Below are the myths and FACTs that are supported by Ecotech. MYTH: Biodiesel uses valuable food resources and diverts them away from human consumption. 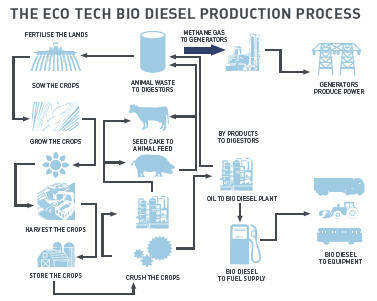 FACT: Biodiesel at Ecotech is produced from waste streams and by-products, so there is no current conflict with food production or human consumption. MYTH: Biodiesel does not have any environmental benefits. FACT: Biodiesel produces significantly less carbon dioxide emissions than oil-based fuels over the full life-cycle of production and use. FACT: In Australia, Biodiesel is produced from waste streams, so this is not an issue for Australian Biodiesel. However, if biofuel demand increases and second generation Biodiesel are not yet put into production, there is a risk that food crops will be used and land could potentially be cleared for biofuel production. FACT: Biodiesel is one of the most thoroughly tested alternative fuels on the market. A number of independent studies have been completed with the results showing Biodiesel performs similar to petroleum diesel while benefiting the environment and human health compared to diesel. Biodiesel is the first and only alternative fuel to have completed the rigorous Health Effects testing requirements of the Clean Air Act in the USA. Currently more than 300 major fleets use the fuel. FACT: One of the major advantages of Biodiesel is the fact that it can be used in existing engines and fuel injection equipment with little impact to operating performance. Biodiesel has a higher cetane number than diesel fuel. FACT: Biodiesel can be operated in any diesel engine with little or no modification to the engine or the fuel system. Pure Biodiesel (B100) has a solvent effect, which may release deposits accumulated on tank walls and pipes from previous diesel fuel use. With high blends of Biodiesel, the release of deposits may clog filters initially and precautions should be taken to replace fuel filters until the petroleum build-up is eliminated. This issue is less prevalent with B20 blends, and there is no evidence that lower-blend levels such as B2 have caused filters to plug. FACT: The recent switch to low-sulfur diesel fuel has caused most Original Equipment Manufacturers (OEMs) to switch to components that are also suitable for use with Biodiesel. In general, Biodiesel used in pure form can soften and degrade certain types of elastomers and natural rubber compounds over time. Using high percent blends can impact fuel system components (primarily fuel hoses and fuel pump seals) that contain elastomer compounds incompatible with Biodiesel, although the effect is lessened as the Biodiesel blend level is decreased. Experience with B20 has found that no changes to gaskets or hoses are necessary. FACT: Most fuel today is used up long before six months, and many petroleum companies do not recommend storing petroleum diesel for more than six months. The current industry recommendation is that Biodiesel be used within six months, or reanalysed after six months to ensure the fuel meets ASTM specifications (D-6751). A longer shelf life is possible depending on the fuel composition and the use of storage-enhancing additives. MYTH: Biodiesel will wreck your engine. FACT: This is completely false. Engine manufacturers are especially cautious about new fuels, but some of biggest names in the diesel world (like Cummings) have cleared B20 from doing any harm. Biodiesel and diesel fuel are similar in chemical structure and have similar properties, so they burn similarly in diesel engines. But Biodiesel has some specific advantages. Biodiesel adds significant lubricity to the fuel which sulphur formally did in diesel fuel, but has since been reduced hence low-sulphur diesel. Biodiesel has a higher cetane number (higher ignitability) and combusts more completely. Biodiesel is also a good solvent and will clean out diesel fuel residue left in the fuel tank and lines. MYTH: Biodiesel doesn't work in cold weather. FACT: It's true that Biodiesel clouds up (starts to freeze) at higher temperatures when compared to regular diesel, but the cold-flow properties vary depending on what the Biodiesel is made from. Feedstocks with more saturated fat, like coconut oil or animal fat tend to freeze at higher temperatures. MYTH: Biodiesel is too expensive. FACT: The price of Biodiesel is linked to the feedstock cost, not the price of crude oil. This means there are different factors that affect the price, such as droughts and the demand for feedstocks other uses, such as cooking oil. MYTH: Diesel engines are more polluting than petrol engines, so selling my car and buying a diesel is a bad idea. FACT: New model diesel engines are more efficient and have advanced catalytic converters allowing them to approach the emissions of comparable petrol models. When combined with Biodiesel newer engines offer significant emissions reductions.